The Leipzig Brühl around 1920. 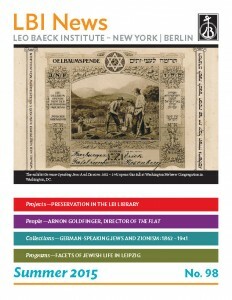 Leipzig Jewish Community Collection, F 9629. One of Leipzig’s oldest streets, the Brühl was flanked by narrow alleys and courtyards with houses that traditionally offered lodging for Jewish fur traders during the Leipzig Messe. In the early 20th century, these were replaced by the furriers’ grand warehouse and office buildings, which reflected the city’s significance as a hub for the fur trade. When this photograph was taken, around 10,000 people worked in Leipzig’s fur industry, supplying about a third of all fur goods worldwide. Leipzig’s Jewish Community has always been defined by migration. Attracted by the opportunities that the Saxon metropolis offered as a center of trade, Jews have made enormous cultural and economic contributions to Leipzig. Although a Jewish community did exist in Leipzig in the Middle Ages, Jews were only allowed short stays in the city between the 16TH and 18TH century. 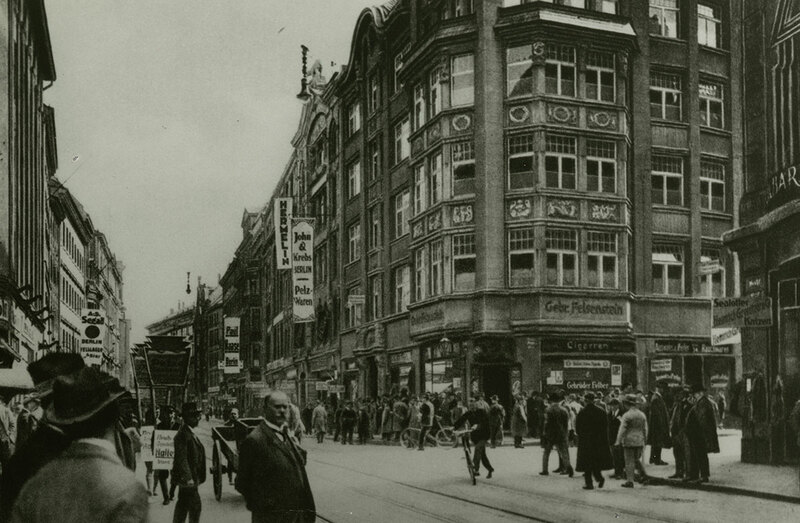 Nevertheless, Jews remained a presence in city life as traders and merchants at Leipzig’s famed Messe (trade fair). Jews were especially instrumental in the fur trade—Jewish traders from Galicia brought raw pelts from Eastern Europe and Asia, while merchants from the West came to procure the wares worn by fashionable men and ladies from Hamburg to London. Around the middle of the 19TH century, a permanent Jewish community was reestablished in Leipzig and grew quickly.By 1920, it was the sixth largest Jewish community in Germany, with over 13,000 members. Jews were among the city’s most prominent citizens, from the “Furrier King” and philanthropist Chaim Eitingon to the music publisher and patron Henri Hinrichsen. Nearly all of Leipzig’s Jews were deported or fled during the National Socialist regime, but after 1945 survivors founded a small Jewish Community, which then grew substantially thanks to the migration of Jews from the former Soviet Union since the mid-1980s.